New and useful ideas and knowledge, commonly denoted innovations after coming into use, are of decisive importance for economic growth and welfare. To promote the generation and diffusion of innovations, most, if not all, industrialized and industrializing societies rely on some form of an intellectual property rights (IPRs) system. 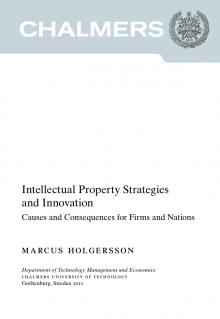 As technological diversification, technological convergence, and open innovation become increasingly important, proper management of and strategies for IPRs and intellectual property (IP) becomes ever more central for the competitiveness of firms and nations. The general purpose of this thesis it to explore and explain the causes and consequences of IP strategies and policies at firm, national, and international levels in different industrial contexts with different types and degrees of openness in innovation. With focus on technological innovations and technology-related IP, various methods are employed to fulfill the purpose. The results show that, due to IP policy developments at national and international level, large firms have increasingly developed various IP strategies, especially patent strategies, to appropriate returns from innovations. As an example, large firms were found to in a first step increase their patenting (in terms of quantity), and in a second step focus more on selective and quality-oriented patenting in which the IP-related work is also internationalized. This internationalization of IP heavily impacts the patent offices and IP policies, especially in small countries where the national patenting tend to decrease as a result. Small firms on the other hand cannot gain the same benefits as large firms from an IPR system, especially from the patent system as currently designed, since they do not have enough resources for monitoring and enforcing their rights, which in turn limits the protective function of patents. Instead, small firms use patents to attract customers and investors. Patents then provide a governance mechanism for early stage financing of innovations. A new measure based on statistics at the national level indicates that the preferred markets for patenting from firms and inventors in various countries become increasingly similar. In addition, there is a convergence of national legal IPR systems around the world. Developing and industrializing nations in this convergence process typically switch from a weak to a strong IP regime in their national innovation systems, at a point in time when the mainly innovative benefits of a strong regime outweigh the mainly imitative benefits of a weak regime for the nation and its firms. A similar switch from a weak to a strong IP regime can be seen in various innovation systems, e.g. in mobile telecommunications. The openness of innovation in such a corporate innovation system is closely related to the IP strategies of the involved firms, and the results show that the openness in a system is directly and strongly affected by changes in the IP strategies of its firms. The thesis shows the importance of the interaction between IP strategies of large and small firms, between different large and small nations’ IP policies, and between IP strategies of firms and IP policies of nations. Such interactions are essential to consider for future research, as are the roles of IPRs and IP management in innovation systems with various degrees of openness. This is a Licentiate thesis from the Department of Technology of Management and Economics, Chalmers University of Technology belonging to the series ISSN 1654-9732. You may order a copy by contacting Marcus Holgersson.